This Dar Olona crystal 3 lamp semi flush light in polished chrome features faceted crystal squares on a bright chrome frame and glass diffuser. 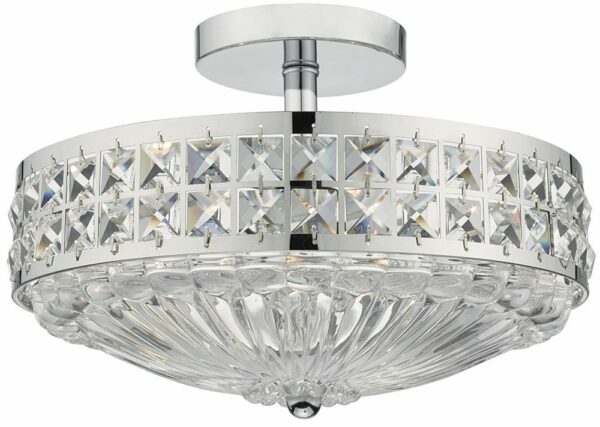 Circular semi flush mount, short drop rod and circular frame in polished chrome, with two rows of faceted crystals around the outer edge and decorative clear textured glass diffuser underneath. The three lamps are hidden in the centre of the fitting, allowing the light to sparkle through the crystals whilst giving a softer diffused downward light. This traditional style fitting has been brought right up to date by combining polished chrome, crystal and glass to create a more contemporary look that is suitable for modern and traditional homes alike. At just 22cm high, this fitting is ideal lighting for any room with a low ceiling. A class 2 double insulated ceiling light no earth required. Also available finished in antique brass (OLO5375) which can be found by using the search box at the top of this page. Dar lighting is widely recognised as one of the leading suppliers of a full range of innovative, quality lighting products such as the Olona crystal 3 lamp semi flush light in polished chrome you see here.